Andreas and Christie introduced me to matte glazes and I had some really stunning results with these glazes. (If you would like to take a look at some of my older work, you can go to my first website galateaspottery.eu). 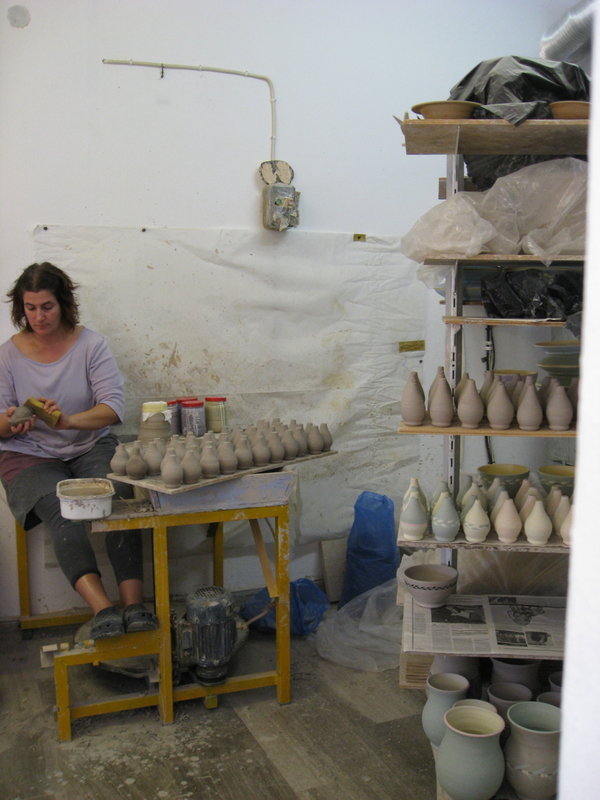 My pottery has developed, grown and changed a lot over the past years in my own studio. I feel now that I have found my own ‘voice’ and style of work. Almost all of my pieces are first thrown at the wheel and then altered. I have exchanged matte glazes for coloured slipware (a liquid clay base to which pigments and stains are added). I paint these coloured slips onto greenware (clay that has not yet been fired). The pieces are then fired for the first time, known as a bisque or bisquit firing. This is the firing in which the clay and colours are solidified. Some thirty hours later, the pieces are removed from the kiln, glazed and carefully replaced into the kiln where they are fired for a second and final time. In the second firing the glaze is brought to maturity and the colours have achieved their end result. I use a transparent shiny glaze which gives me beautiful, vibrant, rich colours. The firings take between 8 and 10 hours each and there is a 24 hour cooling period following each of them before the kiln can be opened (this means that I require 5 days for the firing process alone).